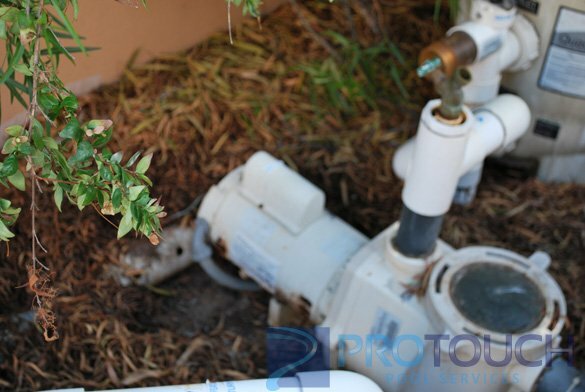 While responding to a service call to repair a pool light at a home in The Crosby Estates in Rancho Santa Fe we noticed the swimming pool and spa water was cloudy. After repairing the pool lights by replacing the two light fixtures, we inspected the pool filter and tested the pool water. 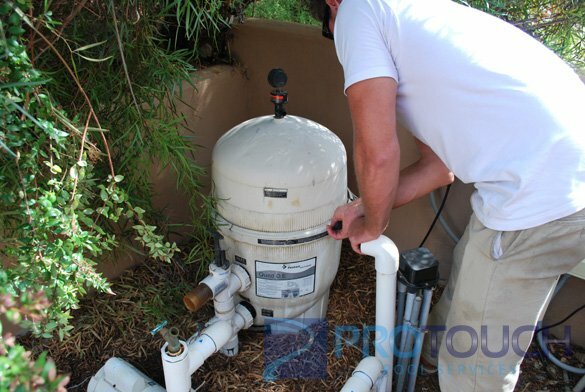 The swimming pool equipment includes a Pentair whisperflo pool pump to circulate the water through the Pentair Quad D.E. pool filter. 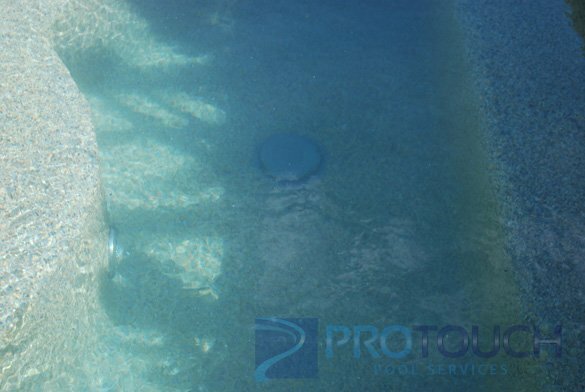 The decision was made to clean the pool filter, add the proper chemicals to the swimming pool to balance the pool water and service the pool. Our goal was to make sure the pool and spa were both clean and safe for use for a pool party scheduled the upcoming weekend. The pool filter clean began by taking apart the Quad D.E. 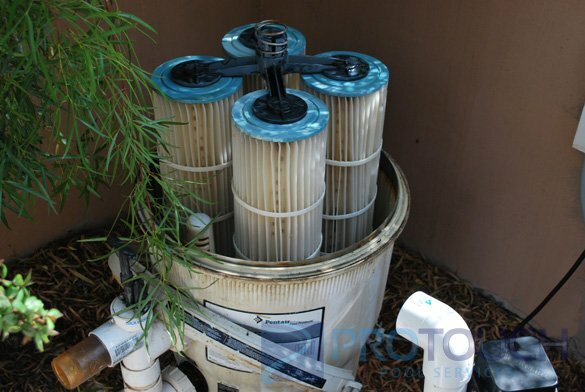 60 square foot pool filter and inspecting the internal filter cartridges. After cleaning the four filter cartridges they were reinstalled because they were in good condition. Once put back together after the filter clean new diatomaceous earth was added through the pool skimmer to recharge the filter. While doing this chlorine tabs were noticed in the skimmer basket which we quickly removed. 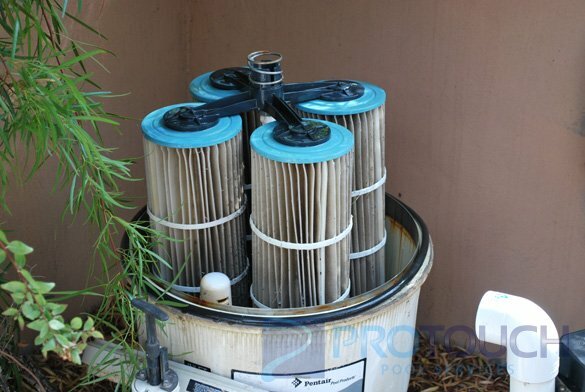 Putting chlorine tablets in the skimmer basket could be detrimental to the pool heater as well as the pool and spa surface. 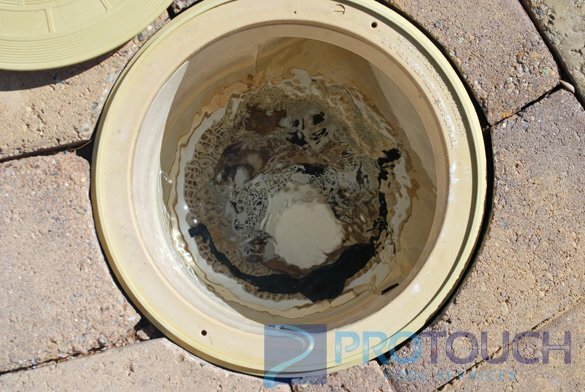 It was also noticed during the filter clean that leaves and other debris had built up around the whisperflo pool circulation pump. The debris was removed to ensure adequate airflow to help keep the motor running properly. Weekly pool service was started the following weekend.